Need compressed, liquid and various mixtures of argon? Argon (Ar) is often used in shielding, blanketing and inerting applications. It also has many protective applications in iron, steel and heat treatment in the cases of when using metals susceptible to nitriding. 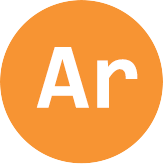 Argon is also used as a carrier gas in chromatography, sputtering, plasma etching and ion implantations. Please see the table below for information and to access safety data sheets on argon gas available from WestAir. Excimer lasers also use argon blended with fluorine and helium. Other applications include cryosurgery, refrigeration, spectroscopy, spectrometry and purging or balancing. Compressed, liquid and mixed argon comes in a variety of cylinder types and sizes to meet your purity and volume requirements.